You can import resource details from a CSV file using the import wizard. All the lines in the CSV file should be consistent and have the same number of fields. CSV files having extensions .txt and .csv are allowed. Click the "Add Resource" button and select "Import from File" from the drop down. Normal File: This option can be used to upload a plain text CSV file directly. Password Protected ZIP File: This option can be used if you wish to upload a password protected ZIP folder containing the CSV file, for enhanced security. If you choose this file format, you must also provide the password and specify the name of the target CSV file in the 'File Name' field. In case the 'File Name' field is left empty, PMP will automatically import information from the first CSV file that it accessed in the unzipped folder. In your CSV file, the entries could be present in any order. You can choose which field in the CSV file maps to the corresponding attribute of the Password Manager Pro resource and account. Both the default and the user defined attributes will be listed in the wizard. The user defined attributes should have been defined before the import operation. If a resource contains multiple user accounts, then the resource fields will have to be repeated for each user account in the CSV file. If you have resources with attributes that can not be placed in the CSV file (like files for the File Store resource type), you can leave those entries blank in the CSV file and later edit the resource and update the attribute value. 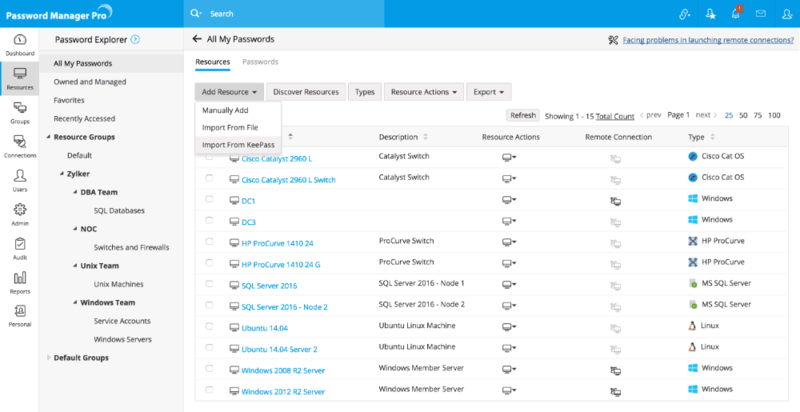 If the list of resources imported by you contains any of the already existing resources, they will not be added to Password Manager Pro by default. If you want them to be overwritten, you need to select the option "Overwrite existing resources". Note: After importing resources, if you want to configure password reset for the target systems, you need to do it by editing the resources. When you try to import a large number of resources, it would take a while to import all of them to Password Manager Pro inventory. Once, it is done, you will notice the message "Resources Imported Successfully". My resources have additional fields ..
You can import the additional fields too. 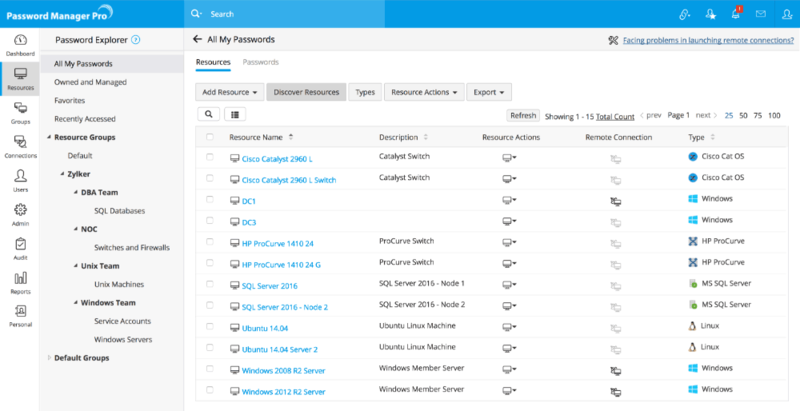 But, prior to importing the resources, you need to add those custom fields to Password Manager Pro. I do not have some of the fields that are listed as mandatory for Password Manager Pro in my CSV file..
That is not a problem. Only 'Resource Name' and 'Account Name' fields are mandatory. So, you can import whatever you have. 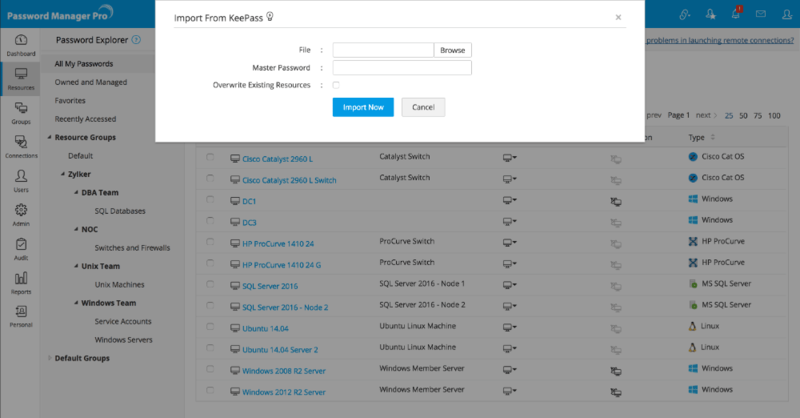 You can also import resource details (IT resources, their accounts, and passwords) directly from KeePass (both 1.x and 2.x) using the import wizard. The import file should be a KeePass database file, either .kdb or .kdbx. Click the "Add Resource" button and select "Import from KeePass" from the drop down. In the pop-up form that opens, browse and select the required KeePass Database file for "Import File." Usually, the file will be available at the location chosen by you while saving the file in KeePass after its creation. After selecting the file, enter the Master Password you have set for the file. Note: Currently, you can import resources from KeePass only using Master Passwords, and not Key Files. So, ensure the selected file has a Master Password. "Overwrite Existing Resources": Check this option if you want the import operation to overwrite resources that already exist in Password Manager Pro. If this option is off, resources already existing in Password Manager Pro database will not be imported from KeePass. Click "Import Now." The result of every line imported will be logged as an audit record. During the import operation, resource details such as resource URL, user accounts, passwords, and notes will be automatically mapped and imported from KeePass. For DNS Name/IP Address, details in the file will first be validated with inbuilt regular expressions and will be imported only if they match. Also, in the database file, if you have stored the resources within different static groups such as Windows, Linux, etc. the groups will also be automatically created in Password Manager Pro while importing the resources. Once the resources and groups are imported, the Resource Type of all the resources will, by default, be Unknown in Password Manager Pro. You can edit the resources and sort them under desired types. In case of web site accounts alone, the resources will be automatically sorted as "Web Site Accounts," if the site URL is provided in the import file. After importing resources, if you to configure password reset with the target systems, you need to do it by editing resources. You can import the computers in your domain and the user accounts part of those computers as resources in Password Manager Pro. Navigate to "Resources" tab in the web interface. Click the "Discover Resources" button. In the UI that opens, select "Windows" from the options on the left hand side. The first step is to provide credential details for importing resources from Active Directory. Password Manager Pro automatically discovers and lists all the Windows domains from the Windows domain controller of which the running Password Manager Pro is part of. From that list, you need to select the required domain and provide domain controller credentials. Select the required Domain Name from which the resources (computers) are to be imported. Specify the DNS name of the domain controller. This domain controller will be the primary domain controller. In case, the primary domain controller is down, secondary domain controllers can be used. If you have secondary domain controllers, specify their DNS names in comma separated form. One of the listed secondary domain controllers will be used. When you use SSL mode, make sure the DNS name specified here matches the CN (common name) specified in the SSL certificate for the domain controller. Enter a valid user credential (user name and password) having admin privilege or the name of the user present in Domain Admins group. For each domain, you can configure if the connection should be over an encrypted channel for all communication. To enable the SSL mode, the domain controller should be serving over SSL in port 636 and you will have to import the domain controller's root certificate into the Password Manager Pro server machine's certificate. As mentioned above, to enable SSL mode, the domain controller should be serving over SSL in port 636. If the certificate of the domain controller is not signed by a certified CA, you will have to manually import the certificate into the Password Manager Pro server machine's certificate store. You need to import all the certificates that are present in the respective root certificate chain - that is the certificate of the Password Manager Pro server machine and intermediate certificates, if any. In the machine where Password Manager Pro is installed, launch Internet Explorer and navigate to Tools >> Internet Options >> Content >> Certificates. Browse and locate the root certificate issue by your CA. Click "Next" and choose the option "Automatically select the certificate store based on the type of certificate" and install. Browse and locate the domain controller certificate. Apply the changes and close the wizard. Repeat the procedure to install other certificates in the root chain. Password Manager Pro server can now communicate with this particular domain controller over SSL. Repeat these steps for all domain controllers to which you want Password Manager Pro to communicate over SSL. Note that the DNS name you specify for the domain controller should match the CN (common name) specified in the SSL certificate for the domain controller. If you want to import only a particular computer, enter the required user name(s) in comma separated form in the field "Resource(s) to Import". Similarly, you can choose to import only specific resource groups (i.e. computer groups) or OUs from the domain. You can specify the names in the respective text fields in comma separated form. Once they are imported, Password Manager Pro resource groups will be created with the name of the corresponding Active Directory computer groups, prefixed by the domain name. Click "Fetch Groups and OUs". Soon after hitting this button, Password Manager Pro will start adding all computers. 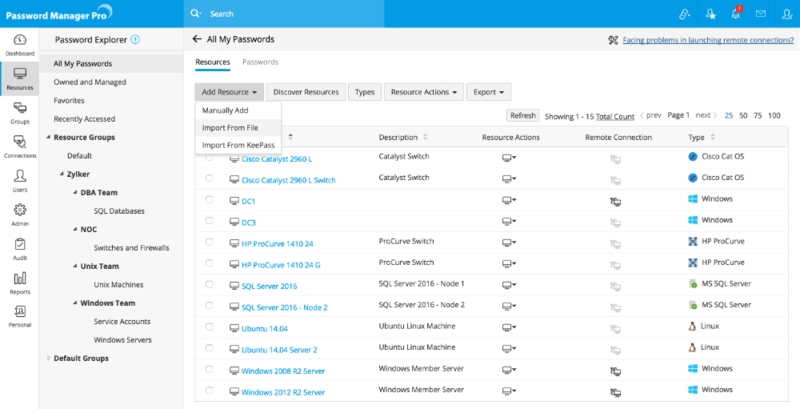 Note: After importing resources, if you want to configure remote password reset for the target systems, you can do it from Resources >> Resource Actions >> Configure Password Reset.